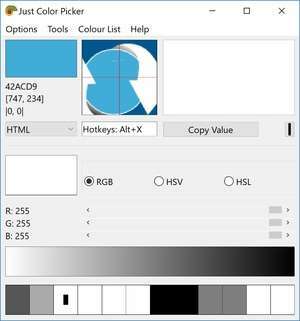 A free color picker and color mixing tool, including harmonious color finder; features 5 formats of picked color value (HTML, RGB, HEX, HSB/HSV, HSL), 3x/9x/15x zoom, saving picked colors history, RGB & RYB color wheels that display triads and complementary colors, RGB and HSV color mixers, optional stay-on-top and a user-defined hotkey to capture color info. A portable program, no installation required (just download and start using). Version 5.2 is a freeware program which does not have restrictions and it's free so it doesn't cost anything. For security reasons, you should also check out the Just Color Picker download at LO4D.com which includes virus and malware tests. Additional screenshots of this application download may be available, too.